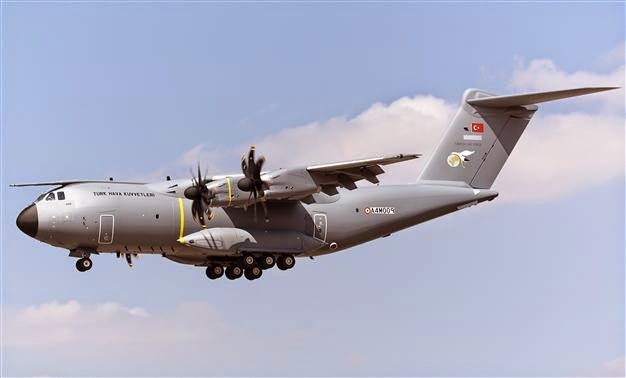 Turkey is preparing for further delays in the delivery of two A400M military transport aircraft it ordered from Airbus Group, according to defence officials in Ankara. It signed a deal for 10 of the heavy cargo and troop carriers in 2003 as part of a group of seven European NATO nations, expecting its part of the order to be fulfilled by 2018. After four years of delays in Europe’s largest defence project, Turkey received two of the aircraft in 2014 and was due to receive two more this year. But officials told Reuters that the latest deliveries are now likely to be late. Airbus will have to pay a penalty or offer services for the new delays, they said, without giving a new timeline. “The penalty will depend on the number of days the deliveries are delayed, so the figure is not clear yet. Receiving products and services from the company is also possible,” one of the officials said. Airbus Military is in the process of negotiating a new delivery schedule for the A400M but has not so far published a timetable. However, industry sources say its base production plan of 14 aircraft for this year includes two for Turkey. “We are currently discussing A400M production with all the customers and we will communicate further on that when the discussions are complete,” an Airbus Military spokesman said. Airbus clashed publicly with Turkey over the A400M last year, saying it was Ankara that was delaying taking delivery of the first aircraft as a “bargaining” move. But several buyers, notably Germany, have grown increasingly concerned about the latest round of delays, and analysts say declarations about the troubled project have tended to reflect tough negotiating positions on all sides. Turkey took part in a seven-nation, 3.5-billion-euro bailout in 2010 that was supposed to put an end to chronic delays and technical problems with the European transporter plane. But Airbus acknowledged last year that it faced new delays and in February took a charge of 551 million euros ($618 million). Other European buyers – jointly represented along with Turkey by defence procurement agency OCCAR – include Belgium, Britain, France, Germany, Luxembourg and Spain. Malaysia has also agreed to buy the plane, which fits between the smaller Lockheed Martin C-130 and larger Boeing C-17.